You can buy a book at the Google eBookstore and read it on a NOOK Tablet. Maybe you want to continue reading the same book on your iPhone as you commute to work or read some more on the computer at your desk. As with the NOOK store, the books are tied to your account — not to a specific piece or brand. If you haven’t already done so, install the latest version of Adobe Digital Editions on your laptop or personal computer. You may be prompted for an Adobe ID. If you don’t have an Adobe ID, you’ll see a link on-screen to get one. From that point, anytime you buy an item online with a service (like Google eBookstore) that requires Adobe Digital Editions, the item is automatically associated with your Adobe ID, rather than your computer. Once you have installed Adobe Digital Editions, here’s how to buy books from Google eBookstore and transfer them to your NOOK Tablet. Open a free account with Google. The same account tags along if you use other Google tools, including Gmail. Pay for the license to own a copy of the book. The file is added to your Google account. In the list, find the book you want to transfer to the NOOK Tablet. Click the About This Book button. Click Read On Your Device. You may see an EPUB version, a PDF version, or both. Click one of the links to transfer the ACSM file onto your computer. Be sure you know where the file is stored. You need the file to unlock the book. If you’re given a choice between an EPUB or a PDF file format for an eBook, go with EPUB: it is more likely to include most or all current features for the NOOK Tablet include reflowable type, adjustments to typefaces, and more. Find and click on the ACSM file on your computer. It may be in a Downloads folder or on the desktop. If you can’t find the file, search for *.acsm. The document should open in Adobe Digital Editions. If clicking the file doesn’t open the Adobe software, find ADE on your computer and start the program. Then select Add Item to Library from the Library menu, and find the ACSM file on your computer. If you aren’t in Library view, click the icon in the top-left corner. The book you bought from Google eBookstore doesn’t show up in the All Items bookshelf in the Library view. Turn on and connect your NOOK Tablet to the computer with the provided USB cable. Adobe Digital Editions should recognize your NOOK Tablet as an authorized device and display it on the left pane of the software. If you don’t see your NOOK Tablet, close Adobe Digital Editions and then reopen it with the USB cable in place, connected to your NOOK Tablet, which should be on. 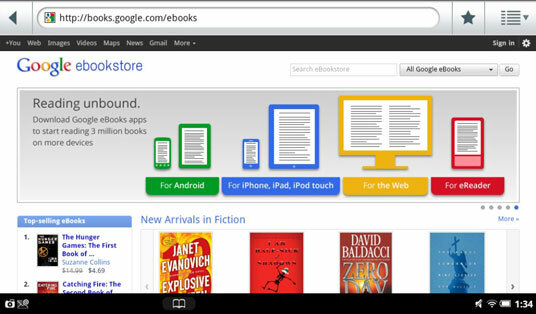 Click and drag the Google eBook in the right pane onto the NOOK Tablet icon in the left pane. If you can’t drag a book from the library to the NOOK Tablet, the Adobe software hasn’t recognized your tablet as an authorized device. Consult the Adobe help screens. If you want to confirm the transfer, click the NOOK icon and find the book file there. Eject the NOOK Tablet from your computer before unplugging it. Windows users can go to Explorer to find the NOOK and its memory card; right-click each and choose Eject. Macintosh users will find similar icons for the tablet in the Finder.